An exhibition by renowned photographer Andy Gotts opened today at Somerset House, with a display of photos of actors who have won or been nominated for a BAFTA since 1954. “Behind the mask”, a collaboration with the British Academy of Film and Television, features photographs of more than one hundred actors, and it took Gotts two years to finish his work. “I wanted a valid reason to travel the world and meet my movie heroes”, says Gotts. The exhibition is released just in time for the BAFTA awards, which will take place on February 16th. That weekend, part of the collection will be moved to the BAFTA headquarters in Piccadilly, with some of the photos being projected onto the façade of the building. For Gotts, these photographs come in time for the awards season, but he sees it as a timeless issue: “People are always interested in famous people portraits, especially as I don’t retouch mine. The public wants to see what they actually look like”. “I try to get something different out of someone who has been photographed hundreds of times. Famous people have the same ‘faces’ for all their portraits, so I try to winkle out something different”. Nevertheless, Gotts, who also has part of his work displayed at the National Portrait Gallery, considers his collaboration with BAFTA unproductive, as it interfered with his habit of working at a fast pace. “They have meetings about everything and nothing is done in a hurry. I think a collaboration with a large organisation is something I will not go into lightly again”, stated Gotts about this partnership. Among the actors photographed, Lauren Bacall, Al Pacino, Sidney Poitier or Scarlett Johansson stand out, although Gotts remembers the late Paul Newman and Tony Curtis as his favourites, the first being “one of my favourite actors” with whom he spent “a few hours talking about the old movies and Robert Redford”, while the latter holds a special place in his heart because “my portrait of Tony was the last photograph ever taken of him”. 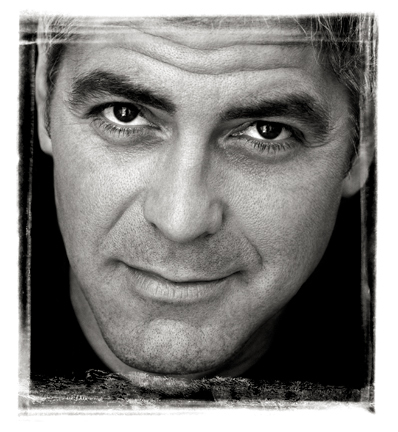 “George Clooney has the ability to make you feel you are the most important person in his life”, remarks Gotts about the American actor. The photographer has been taking portraits of famous thespians for over two decades, and he has worked with publications such as Empire, French Vogue, FHM, El Mundo or Total Film. In relation to this year’s BAFTA awards, self-declared movie buff Gotts shared his predictions of the possible winners: 12 Years a Slave as Best Picture, Best Director and Best Actor, with Philomena as Best British Film and the other acting gigs going to Cate Blanchett, Matt Damon and Jennifer Lawrence. The exhibition at Somerset House is open to the public every day from 10:00 to 18:00, and it will run until February 7th. The entry is free. I would like to thank Gotts for letting me use some of the photos exhibited for the article.